May the prayers of the Blessed Virgin Mary lead us closer to the heart of her Son Jesus Christ, our Savior and King. P.S. This week all of the priests of the Diocese of Brooklyn will gather for our bi-annual away convocation at the Seminary in Huntington. It will be a week of prayer and fraternity with our Bishop. 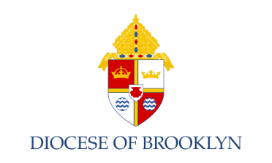 Please keep me, Father Kingsley and the almost 300 priests of the Diocese of Brooklyn in your prayers this week. Last week we commemorated the feast of St. Peter Claver at the 11:30AM Mass at St. Peter Claver Church. We had a full house! I take this opportunity to thank the committee for making it such a beautiful afternoon with plenty of food to go around. As I have mentioned on numerous occasions, great and beautiful things are happening here at St. Martin dePorres. We continue to thank God for all the many blessings that he has bestowed upon us as a parish community. Today’s second reading from St. Paul’s letter to the Philippians is my absolute favorite Pauline text. Allow me to share it with you. “Brothers and sisters, Christ will be magnified in my body, whether by life or by death. For to me life is Christ, and death is gain. If I go on living in the flesh, that means fruitful labor for me. And I do not know which I shall choose. I am caught between the two. I long to depart this life and be with Christ, for that is far better. Yet that I remain in the flesh is more necessary for your benefit. Only, conduct yourselves in a way worthy of the gospel of Christ”. Life is Christ! Everything that we do, the very essence of our being is meant to imitate Christ the Lord. Our conduct must always be worthy of the gospel of Jesus Christ. As a parish community we must always live in the light and love of Jesus Christ. He is our salvation and our strength. May we always keep Christ at the center of all that we say and in all that we do. Our parish is a member of EBC, East Brooklyn Congregations. Over the last few months, we have met to tackle the problem of affordable housing here in our city, particularly Bedford Stuyvesant. Our Mayor has chosen not to listen to the voices of the community with regards to building affordable housing in our community. We are planning an action at City Hall to have our voices heard. The action will take place on Monday October 9, Columbus Day. There are flyers in each of the bulletins. If you are interested in joining us in the action, please see one of the representatives after Mass to sign up.